Accordia is an obscure country on the far, far border of the west that most people miss because they go one step too far and end up in the east. 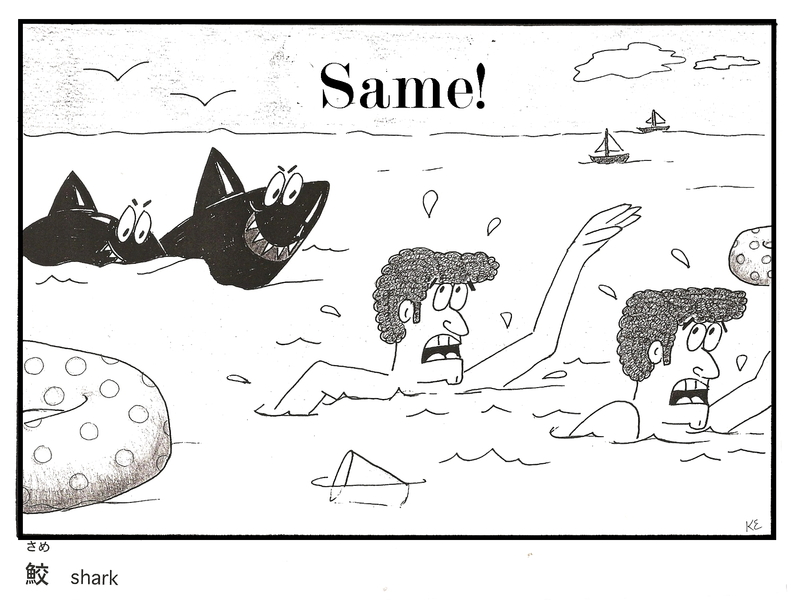 It’s an easy mistake, especially if you are prone to circular reasoning. 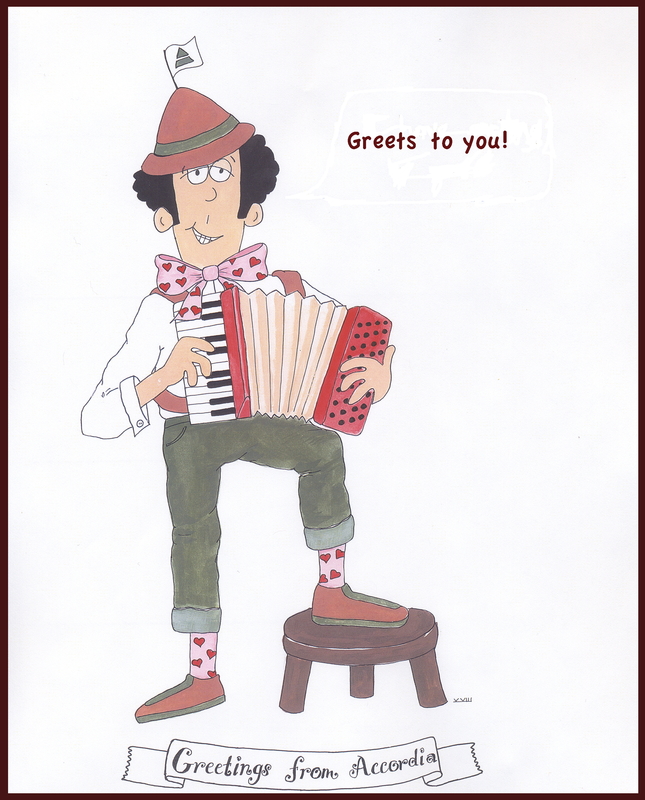 No one had heard of the country until recently (today, in fact), but it is the birthplace of the accordion. Accordians are touchy about this subject, and if you want to push an Accordian’s button, just casually mention that Christian Friedrich Ludwig Buschmann invented the accordion in 1822. After the bellowing stops, tell the person you were just kidding. Normally, Accordians aren’t that loud, but they are if you push them. For unknown reasons, I was selected out of all of the millions of people in the Interlands to be the official representative of Accordia. I have been recording their vibrant history and plan to publish some of it sooner, later, or both. For unknown reasons, I was selected out of all of the millions of people in the Interlands to be the official representative of Accordia. I have been recording their vibrant history and plan to publish some of it sooner, later, both, or either. Yesterday I promised to share the secret of affixation. If you are not yet familiar with the vocabulary (base word, prefix, and suffix), please see here. First, let’s think of the base word as the front of a dog. He says something by barking. 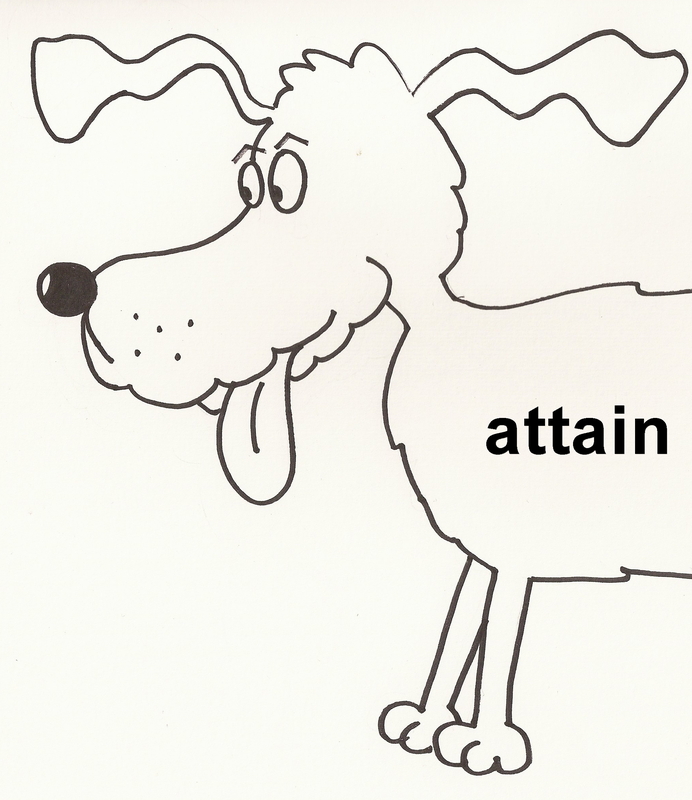 In this case, he is saying the word “attain” because he wants to gain something. 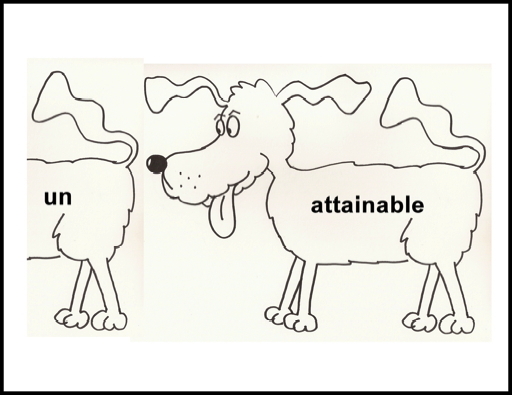 Think of the back of the dog as the suffix “-able.” Now the dog has the ability to gain what he wants. But we still need a prefix, so let’s use “un-” to liven things up. 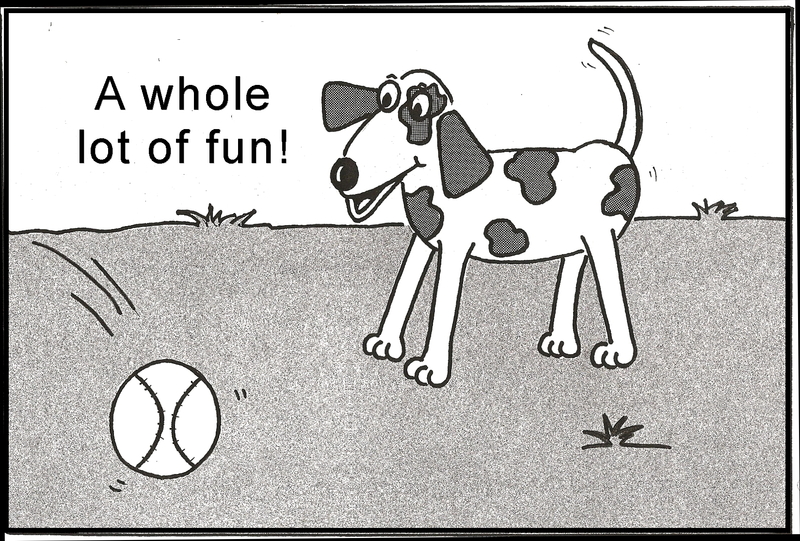 Try as he might, the dog cannot attain what he has set out to get. And here it is all put together. Some of you are nodding your heads because you understand quickly. The rest of you need another example. 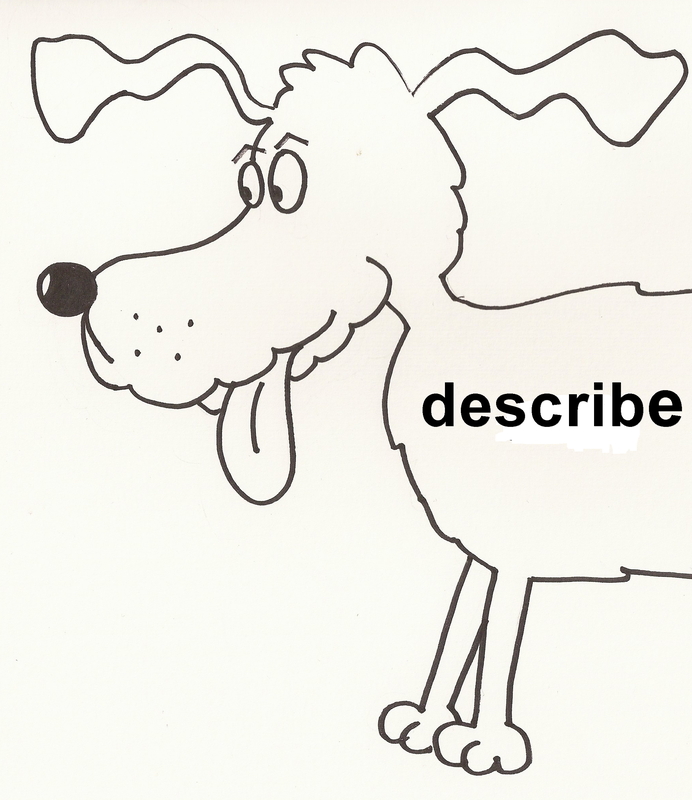 In this case, the front of the dog is the base word “describe” because he wants to tell us what he has found. We will use the same suffix as above in order not to introduce too many new terms and confuse the ones who sit in the back. This makes our little dog happy. But (yes, we will throw in another but) let’s go ahead and add the prefix “in-,” which again makes everything impossible. 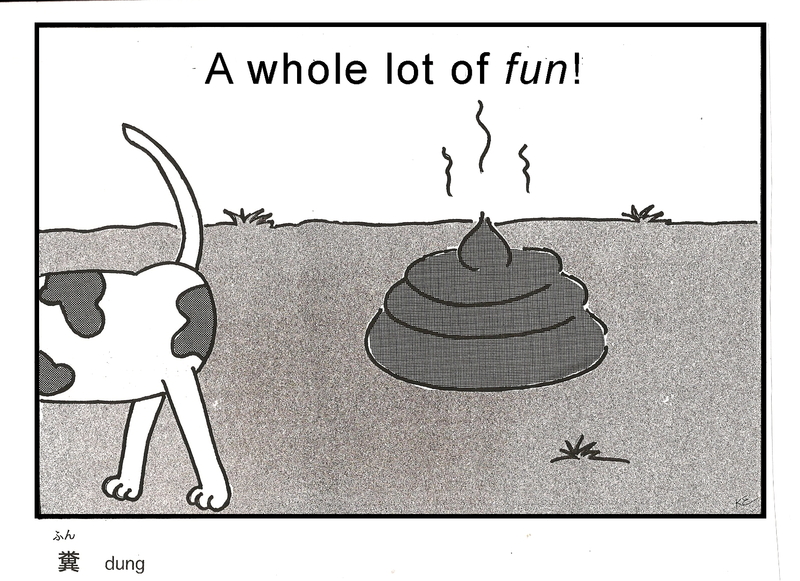 And voila, our mutt can no longer describe what he has found, but in this instance, he can still enjoy it. Before I can show you how this word looks, the “e” in “describe” must be surgically removed. It requires a great deal of skill. Watch and learn. Now friends, I hope you are sitting down because I would like to make an offer to you that I believe will revolutionize your life. Why should I keep this all to myself? Why not share it with the world? 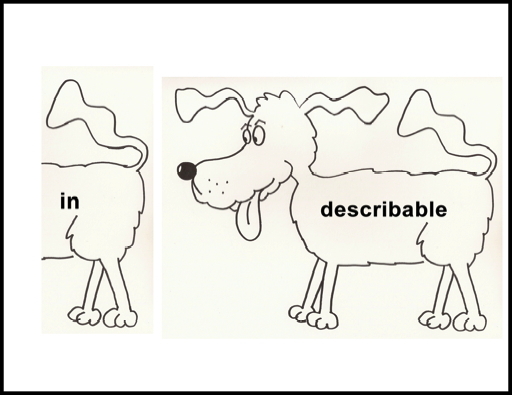 I want you to be able to make words using Dog and a Half. Yes, it’s true, if you will share your money with me, I will share my secret with you! Think of it. 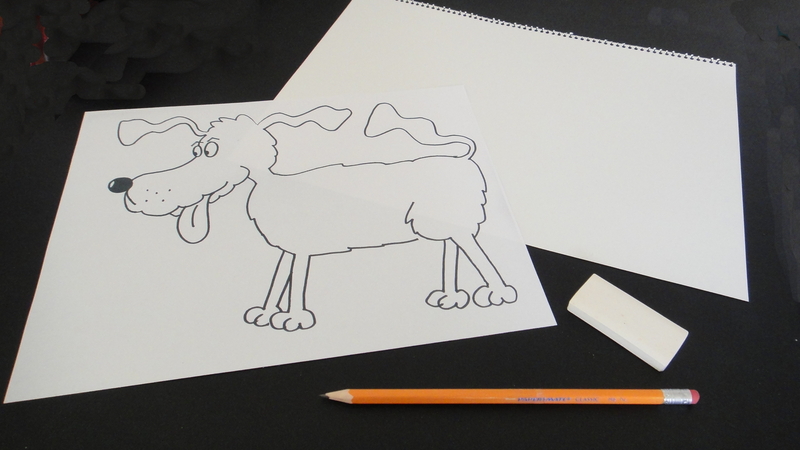 While your friends are sitting around twiddling their thumbs on cellphones texting so-called sentences composed of just three or four letters, you can be making multisyllabic words with Dog and a Half! Perhaps up until now the idea of flummoxing your friends was only a dream. You wanted to do it, but you didn’t know how. Now you can! 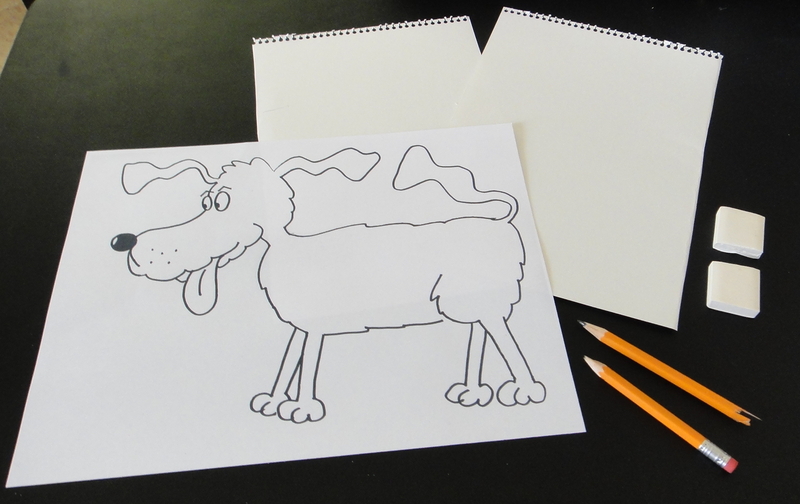 Today for just $9.99, I will send you a template of Dog, a big piece of paper, and a fancy art eraser. AND because I’m feeling especially generous, I will include a recycled pencil. And not just any pencil, but a pre-sharpened pencil with a pink eraser. See below. But wait, there’s more!! 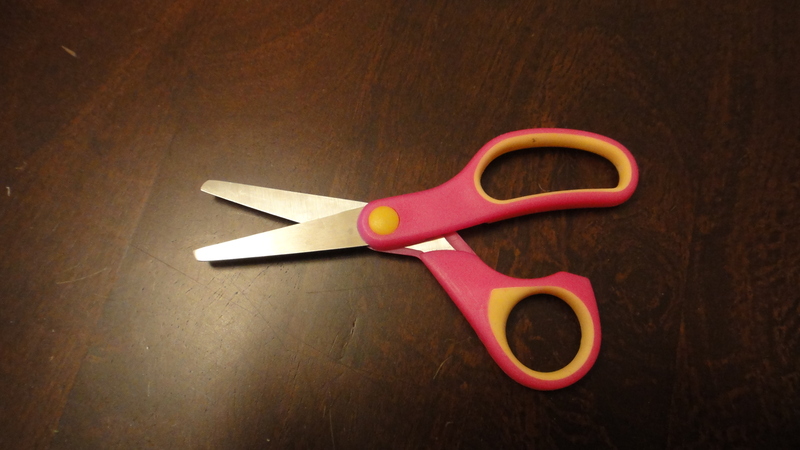 If you act now, for just an additional $5, I’ll include this pair of scissors. People call me crazy for making offers like this. Well, I call myself twice as crazy for offering you double the supplies for a total of just $14.99. But I promised I would be generous today, and I didn’t want to disappoint you. Let’s say you find yourself living with a bear. Let’s also say you are around 5’3” and said bear is almost 6’2”. You like bear; he cooks, does dishes, and changes the oil in your car. Bear is good. But you must sleep with bear. In his bed. It is his because he needs all of it. The bed bears your name: Queen. That is a misnomer; it is a bear-size bed. Sleeping with bear involves something we shall call cuddling. Cuddling is good. That is where baby bears come from. Or not. Either way, it’s nice to cuddle. 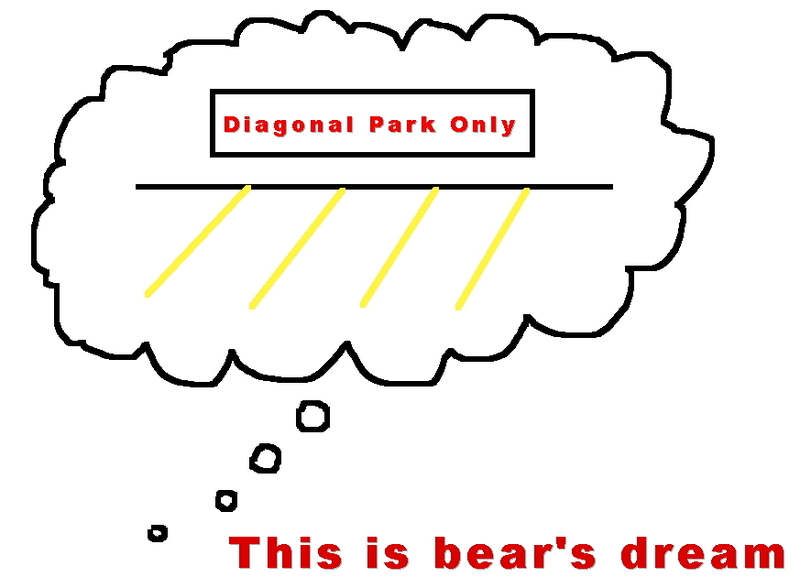 Guideline #1: Bears have diagonal dreams, so they must sleep diagonally. 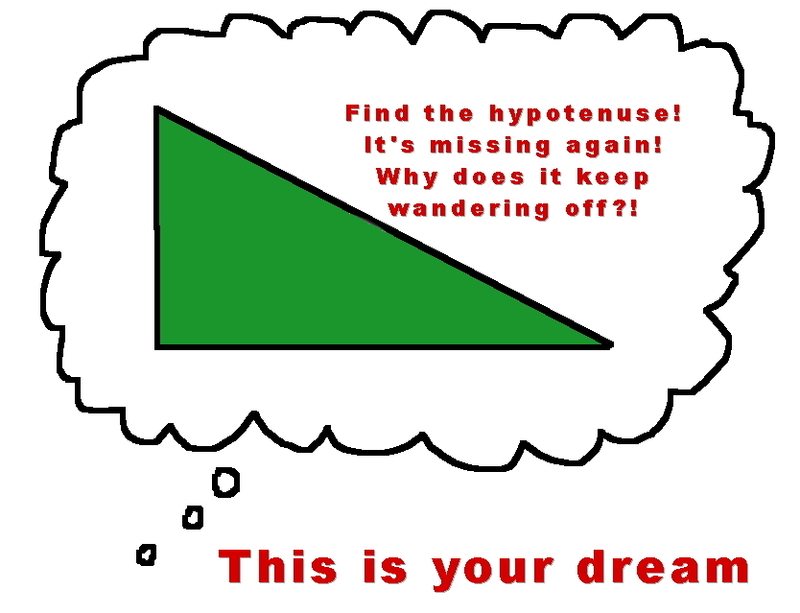 This means you must learn to sleep triangularly and will probably have a number of dreams involving an unsuccessful search for a lost hypotenuse. 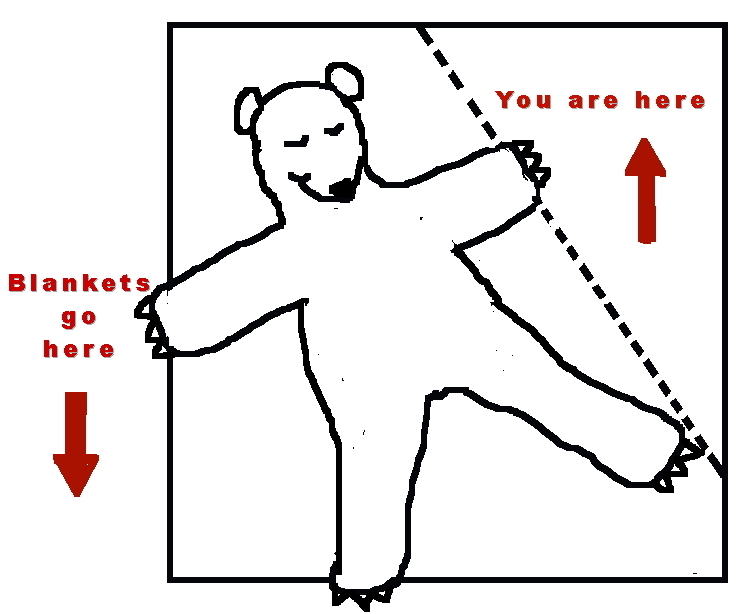 Guideline #2: Bears need all of the blankets. Sub-guideline 2a. Dress appropriately. If your birthday is in the summer months, your birthday suit may work. If not, I suggest pajamas. Long johns are de rigueur in the winter because they prevent the rigor associated with mortis. Sub-guideline 2b. Bears care about the floor more than you do. Floors get cold, ergo the floor needs the blanket more than you do. Guideline #3: Bears often snore, especially when they lie on their backs. When this happens, roll onto your back and shake your entire body as if you are one giant twitch. Continue to the point where the bear almost wakes up, then gently push on his side until he rolls over. Be careful not to fully awaken him. This leads to more cuddling and less sleep. Guideline #4: Bears like your pillow. Several times during the night a bear may try to snuggle into your pillow. If he is a mouth-breather, he will huff and snuffle and blow on your face until you wake up. Grip your pillow tightly, roll over with your back to the bear, and secure the pillow in your corner. Sometimes you will notice a portion of the blanket on your side. Proceed with caution. Pull it gently toward your corner, and enjoy it while you can. 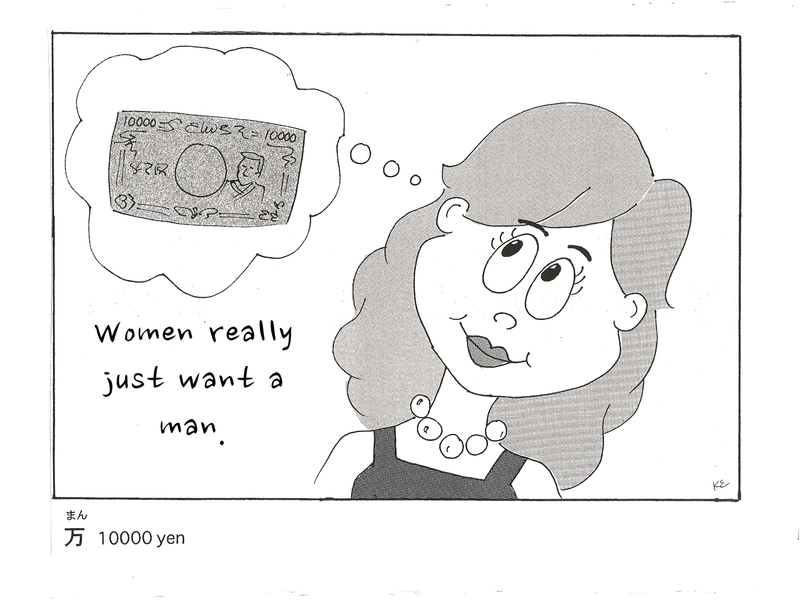 Below is another English-Japanese cartoon. The first one is here. 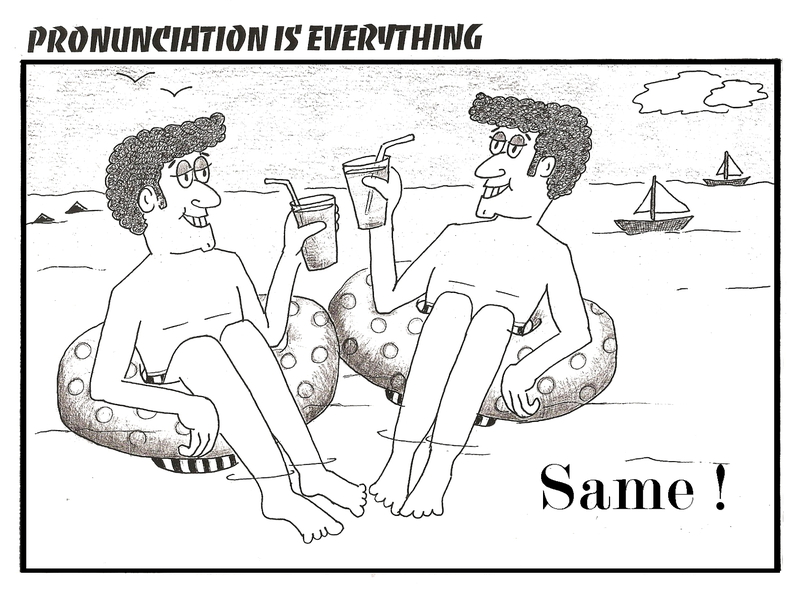 Our English word “same” is pronounced “sah-meh” in Japanese and in hiragana looks like this: さめ . Hiragana is a syllabary, a kind of alphabet of symbols that represent syllables. Have you ever had an out-of-body experience? Me, neither. But I’ve had several out-of-WORLD experiences, in which my body has been lifted high above the WORLD (aka America) and been transported to places far, far away. Oddly, just as in out-of-body experiences, along the way I have been probed by aliens with blank stares, large hands, and wands (aka TSA). Some of these experiences lasted a long time. Not the probing, the being in places far away. Places where people do not speak English, like Japan. 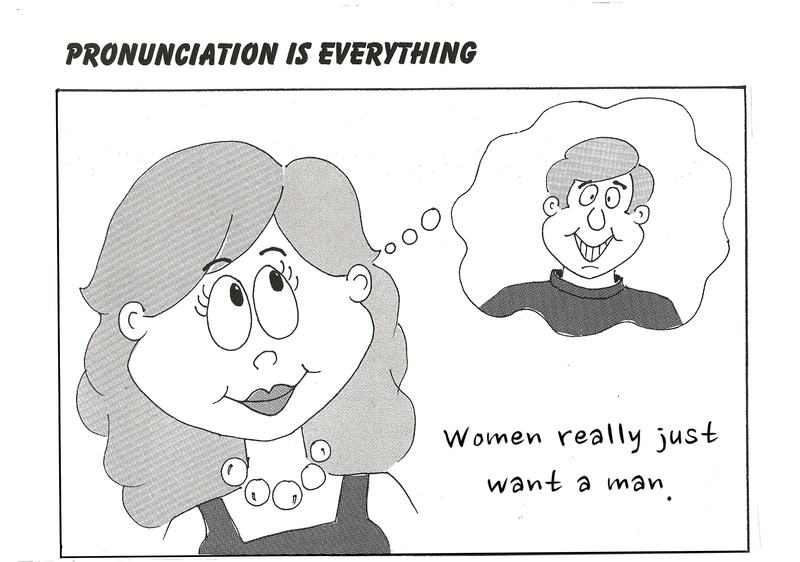 At first, to make myself understood, I tried speaking English slowly. People did not understand me, so I put on my American thinking cap and started shouting in English. LIKE THIS! Finally, in desperation and because I really needed to find a toilet, I learned the language. Now I can irritate people with puns and wordplay in two languages. Once upon a time in that land far, far away, some people who publish a small bilingual magazine in Tokyo were filled with desperation over how to fill the back pages of their magazine. I appeared and offered them six cartoons, which they published. Nothing happened after that. And none of us lived happily ever after; they still had back pages to fill, and I continued on my lonely quest to find desperate publishers. This is my attempt to fill the back pages of my blog.